Tag line: "They were looking for chicks... to go all the way!" Prior to Mars Needs Women, the only other Larry Buchanan film I’d seen was Curse of the Swamp Creature, a sci-fi / horror flick from 1966 that I consider one of the worst ever made. So, going in, I can’t say I had high hopes for Mars Needs Women, which, as it turns out, was a good thing, seeing as this movie is bad on so many levels. The U.S. military decodes a message from outer space that reads “Mars Needs Women”. Sure enough, five Martians, led by Dop (Tommy Kirk), arrive on earth soon after. Due to a genetic defect, the population of Mars is almost entirely male. So, to prevent their civilization from dying out, Dop and his associates have been sent to earth to kidnap five fertile females and return with them to Mars in 24 hours. Disguised as humans, they roam the streets of Dallas looking for suitable women, only to find that they themselves aren’t immune to falling in love. Mars Needs Women gets off to a decent start. During a pre-title sequence, three different women (one of whom was playing tennis at the time) disappear into thin air. We’re then taken to a military installation, where Col. Bob Page (Byron Lord) receives the shocking news that an interstellar communication has been decoded, a three-word message: “Mars Needs Women”. 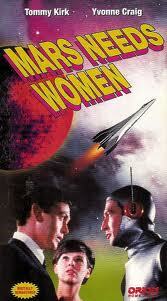 From there on, Mars Needs Women falls apart pretty quickly. The movie’s biggest problem, aside from poor acting and terrible dialogue, is that it just doesn’t make any sense. Shortly after news of the aliens hits the airwaves, it’s announced the U.N. Secretary General has called for the immediate cessation of all global conflict, so that mankind can band together to battle it’s new “common enemy”, the Martians. Really? The abduction of five women in Texas requires a worldwide response? The Martians themselves, who soon become the focus of the entire film, don’t fare any better. After surviving an aerial assault against their spacecraft (which, in reality, was nothing more than stock footage of airline manufacturers testing new equipment), we join the aliens as they rob a gas station, steal some suits from off the rack, and, disguised as humans, spend the rest of the movie spying on women. Boring! I still say Mars Needs Women is nowhere near as bad as Curse of the Swamp Creature, which, despite starring genre mainstay John Agar, is an uninspired mess. But a slightly more polished turd is still a turd, and that’s exactly what this movie is. I wonder if this was one of those times when they came up with a really cool title (you know, like "Snakes on a Plane") and forgot to put in the necessary effort in other areas. After all, if the writing and acting is good enough, it can carry an audience through a movie that doesn't make sense (Prometheus :-) ).